As you know, for the last few years Chris has been serving at Kansai Christian School in two capacities: first as an aide to the 1st-2nd grade classroom, and more recently she has also been the homeroom/Bible class teacher for the 5th-6th grade class. Well, last April the teacher for the 1st-2nd grade had to suddenly return to America for a family emergency, and Chris was asked to fill her position for the remainder of the school year. With just two days notice, Chris went from part-time aide to full-time teacher! Suddenly she was having to create curriculum and figure out the grading system, all things that were brand new for her. 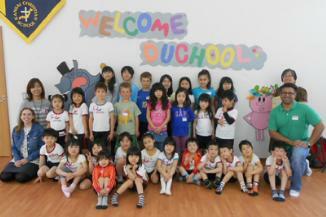 She was also responsible for planning and implementing the pre-school visitation day for perspective new students. On top of this, she still had her responsibilities in the 5th-6th grade class. Talk about baptism by fire! Needless to say, this was a very stressful two and a half months for Chris. However, now that it is finished, she is thankful for the wonderful learning experience and enjoyed interacting with her students in this new capacity. In September, Chris will return to her former duties. The new 1st-2nd grade teacher is a young woman named Colleen, and Chris is looking forward to serving as her aide. PLEASE PRAY that they would develop a good working relationship, especially since there will be an unusually large number of incoming first graders. PLEASE ALSO PRAY for the 5th-6th grade class. This class had a lot of relationship/discipline struggles last year. May the Lord give Chris much wisdom and love to help these students mature and grow into young followers of Jesus. On a side note, when the new school year begins Michael will also resume his duties as school chaplain. PLEASE PRAY for him as he prepares the chapel messages each month. This year he will be teaching on the many promises in God’s Word and how they can/should impact how we live each and every day. May this year be a year of much spiritual growth for the entire KCS student body. This August was the two-year anniversary of the church moving out of our rented facility and into the house of a church member. While we have adjusted well to meeting in a home (and really enjoy it! ), we are still learning how to be the Body of Christ in such a way that faithfully reflects the example we see in the New Testament. Our meeting location has changed, but our paradigms are taking a little bit more time to make the transition. PLEASE PRAY that the entire Oasis Church family would continue to look to Jesus as our Head and our Shepherd. PLEASE ESPECIALLY PRAY for Michael. He really wants to make disciples and develop leaders but is still unsure the best way to do this in our new context. We had the opportunity to spend time with two different short-term mission teams who came to Japan to serve in the tsunami-hit area of Northern Japan. The first was a JEMS group from Austin, TX. Our whole family went to Tokyo to pick them up at the airport and serve as their hosts for 3 days before they headed up north to begin their ministry. The second team was a group of four women from Victory Fellowship in Torrance, CA. The team, lead by Clarice Nakamura, came to Osaka to visit us for a few days before they also made the trip up north to serve in a church. We were so blessed by these opportunities for fellowship and making new friends. 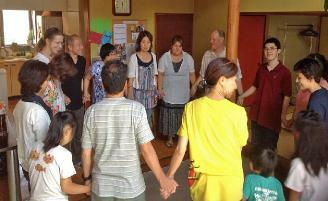 Their willingness to come to Japan on their summer holiday and help build God’s Kingdom was a great inspiration to us. Thank you. Chris was able to make a quick trip to the States in August in order to check in on her parents. As you may remember, they moved into an assisted living facility last December, and Chris thought it would be good to visit them and get an update on their progress. Chris’ father still misses his independence, but is slowly realizing that it is nice to have 24-hour caregivers close at hand. As for Chris’ mother, her Alzheimer’s medication seems to have reduced her mood swings which has made things easier on everyone (especially Chris’ dad), and with the exception of some memory issues, she continues to be quite alert. Chris was also encouraged to see that they have both put on a bit of weight since December which is a very good sign. They were unable to cook for themselves when they were living alone, so it is nice to see that they are now being well fed. We deeply appreciate everyone’s prayers from Chris’ parents. For some time now we have been considering getting a new (used) car. Our 1993 Honda Accord had served us well for many years, but it was starting to require some major repairs. We didn’t have the funds to buy a car for ourselves, but God, being the wonderful heavenly Father that He is, provided what we needed at just the right time. About a month after we had to get rid of our old Accord, an unexpected gift came in that allowed us to move forward with a purchase. 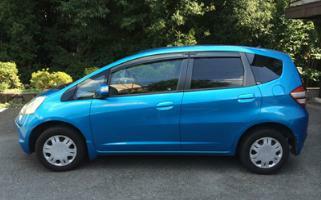 As of early August, we are now the proud owners of a 2009 Honda Fit. The car is way more than we could have asked for or imagined, and we are very thankful to the Lord for His faithful provision.